Getting excited and nervous about your trip yet? Or too busy to think about it? Since I’m passing the baton on to you, I thought I should suggest a few things I’d like to have had figured out before I started. Sorry if all this is obvious… but took me a while to nut out. I realise you’ll only be on the road a week, but you might find some of it useful. –gear: I believe El’s already sent you a packing list, so I won’t go into too much detail on gear. Minimalism! I thought I was packing light and ended up sending a bunch of stuff north. Interrogate every item. Every gram and cubic centimetre counts on these little bikes. But you’ll need two sets of cool/casual (cotton or thin synthetic) next-to-skin clothes, both of which you should be comfortable wearing with or without your armoured gear. After extensive research and testing, the best routine is to wash one set at the end of each day – if you have access to a shower, just step into the shower with them on and go from there! The earlier you can get them wrung and drying the better. Then step into your second set, wear them through the evening and for the next day of riding. Repeat. You get filthy on the bike in the heat, and always having clean clothes in your pack is a real morale-booster. Duh, right? This was all news to me. In addition to the above you’ll want warm layers of course, but they should be layers that can be warn together at the same time and under your moto jacket, pants, and helmet (otherwise it’s wasted space / weight). Plus a lightweight raincoat for when you’d rather not lug your moto jacket on foot. Bring liners for your moto gear, if you have ’em, although unless the cold is extreme it’s easier to leave the liners out and just use your regular clothes for insulation (so you don’t have to mess around inserting and removing the liners). suburn– Sunburn points in full moto gear are are neck, nose, cheeks and lips – one fair gringo to another. Make sunscreen / chapstick your morning routine! luggage – Looks like you’ll have this big red ‘drybag’ (45 L), plus your daypack to strap to the bike. The red bag is sticky with glue from useless duct tape that El tried to patch the holes with (I cut away the dregs of the tape yesterday). I suggest bringing a liner to make it really waterproof – you could use a garbage bag, which will last about 10 minutes, or one of those thin lightweight ‘drybags’ that feel like raincoat material. I suggest the latter, depending on your budget. One for your backpack too. 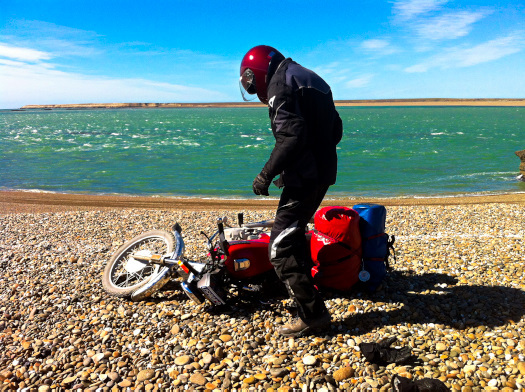 There is a right way and a wrong way to strap the drybag to the bike (I lay awake thinking about these details). The opening should be facing away from the kickstand, on the ‘high side’, so that if you need to access the bag, your stuff doesn’t come tumbling onto the road. Anything that can be damaged or crushed by a strap should not go in the red drybag… because it will get damaged or crushed. Use the red bag for camping stuff and your uber-warm gear that you don’t ordinarily need. Use your (waterproof – lined) backpack for quick-access valuables, electronics, toiletries, water, headlamp, and your set of clean clothes. That way, if you’re not camping, you can just detach your backpack and you have everything you need to stay in a hostel / hotel and you don’t have to mess around with the big red bag at all (except maybe moving it for security). Wallet and passport should be sewn into your skin. Always tie up the loose ends of the straps so they can’t dangle into your wheel or obscure your brake light. As for the bag you’re bringing your checked luggage in, bring something disposable or extremely lightweight that you can squash down. I brought a light duffel but it annoyed me so much that I sent it away. I’ll be buying some ghetto-duffel to transfer my stuff into when I leave. the bike – The Honda Storm is a little hero. I can’t believe how it’s stood up to the punishment I’ve put it through. But it is only a 125 street bike, and El seems to think we’re on Dakar out here. So you gotta take care of it. Last oil change was today at 8,500km. Chain should ideally be cleaned and lubed every morning, or at least every other day. If you hear a rasping sound when you’re moving the bike around with the engine off, it’s parched! The chain should also be tightened every few days. The chains down here don’t have o-rings, so they stretch like crazy and keep stretching. You’ll need to adjust the fuel intake for high altitude and adjust the idle accordingly (the bike should idle at 1,500rpm when warm). Tire pressure is 28 front and 32 rear. Redundant! Last (and only) full service was in Mendoza, forever ago. That’s about all I know about bikes. Keep your visor clean! traffic – Welcome to a whole new world. No rules. Speed, momentum, and mass have right of way. Double lines mean nothing. Drivers will pass you on double lines, on blind corners, on crests, it’s madness. Just assume they’re all in a coma with their pedal to the metal. The idea of a motorcycle occupying an entire lane is foreign here. They’ll cut past you in what you thought was ‘your’ lane. They’ll brush by and honk in a festive spirit while you’re suffering a cardiac arrest. Coming in the opposite direction, they’ll pass a slower vehicle and hover in your lane far longer than is reasonable, coming dead at you, and occasionally run you off the road completely. What to do? Be as aware of what’s behind you as what’s in front of you, always leave a margin for error and stupidity, be visible. I bought a fluoro vest that I’ll leave with the bike, so you can choose between style and visibility. Where possible, avoid riding directly behind Elisa. You can’t see potholes or dogs or anything on the road until it’s right under your front wheel. On the highway, I like to ride in the left tireline (with Elisa ahead, in the right tireline). That way you can see what’s ahead, and drivers behind and in front can see that they’re approaching two motorbikes instead of one. It also means that passing drivers are forced to take a wider berth around Elisa (but watch out for yourself, check you side mirror every few seconds and move to the right tireline when you see the passing vehicle begin to go around you). dirt roads – The looser and deeper, the more difficult to maintain control. Scan the road surface as far ahead as possible, look for bad patches – a change of colour or texture, and set up for it well in advance (ie slow down, downshift and be ready to accelerate through it, go around it, or stop before it). I had virtually no off-road experience before this trip. My reflex was to hit the brakes when I hit loose gravel or sand, but this is bad, bad, bad! It’s incredible I stayed upright during that initial phase (I had many close calls). Here’s the golden rule: deceleration has a de-stabilising effect, acceleration has a stabilising effect. Slow down before you hit the loose sand / gravel, and then accelerate through it, keeping your eyes ahead. If you suddenly feel the bike wobbling around on an unanticipated patch of sand, your reaction should be throttle rather than brake. It took me a while to get the hang of this, it’s very counter-intuitive to me. But it really works.Sand is the worst. If it’s too deep or long to safely ride through, don’t be ashamed to get into 1st gear and do the flintsones. Otherwise, keep your weight heavy on the footpegs and accelerate decisively. Remember that you can steer with your footpegs. Very effective on dirt, when turning your handlebars doesn’t always have the desired effect. I had no idea! wind – Wind is the worst. When it’s strong and gusting, it can blow you all over the road, into the other lane, towards a low cliff-edge barrier that might save your bike but will allow you to go sailing over. Lean into the wind, keep the revs up, downshift for power. I find that the faster you go, the less the wind affects you, but of course the consequences are higher. 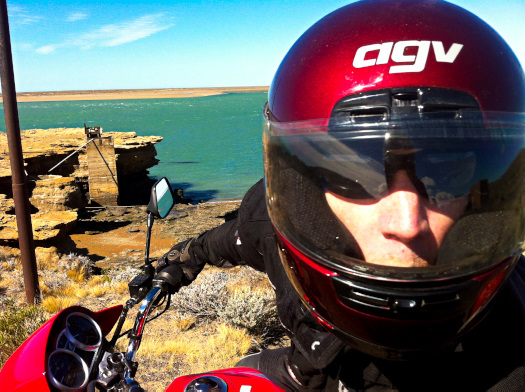 I think the worst of the wind is behind us in Patagonia (we had gusts of 80km/hour). But if it happens, and you’re half as scared as I was, pull over. El doesn’t notice gale-force winds and will simply press on until she’s airborne and spiralling into the clouds. Then she’ll ask why you’ve pulled over. fun – believe it or not, navigating the above somehow amounts to abnormal amounts of fun. Be safe and enjoy! Okay. Way more than I intended to write. See more funny adventure travelogues at PaperTrailTramp. And what will I do when he’s gone? Who will guard my lane, and pick up my blown over motorcycle? Who will require us to eat in every little shack along the road, snacking our way across South America? Who will be my body guard and comedian?